GENERAL DESCRIPTION STYLISHLY PRESENTED & WELL PROPORTIONED EXTENDED MATURE Brick Built SEMI DETACHED HOUSE ** THREE BEDROOMS (TWO DOUBLE, ONE with FITTED WARDROBE) ** TWO RECEPTION ROOMS ** POLISHED GRANITE, TRAVERTINE & DRESSED STONE FEATURES ** RECENTLY REFURBISHED CONTEMPORARY LIGHT NEUTRAL DECOR ** SPACIOUS BAY FRONTED LIVING ROOM with FEATURE DRESSED STONE MONUMENTAL STYLE FIREPLACE ** SEPARATE EXTENDED LOWER DINING ROOM ** MODERN FITTED WHITE GLOSS BREAKFAST KITCHEN with INTEGRAL WASHING MACHINE, WINE FRIDGE, ‘NEFF’ STAINLESS STEEL OVEN & CERAMIC HOB ** MODERN WHITE TRAVERTINE TILED SPA BATHROOM with SHOWER over WHIRLPOOL BATH ** Gas CENTRAL HEATING with COMBINATION BOILER ** White uPVC DOUBLE GLAZING ** LARGE ENCLOSED REAR LAWNED, PATIO & RAISED DECKING GARDEN with BRICK OUTHOUSE & SOUTH WESTERLY ASPECT ** TANDEM DOUBLE DRIVE & PARKING FORECOURT ** CONVENIENT for LOCAL AMENITIES & COMMUTING to LEEDS & BRADFORD by CAR, BUS & TRAIN ** NO CHAIN SALE. This stylishly presented and well-proportioned home will be of particular interest to discerning families and professional couples seeking distinctive character accommodation with generous gardens in an advantageous and convenient residential location. ENTRANCE HALL 4′ 9" x 3′ 9" (1.45m x 1.14m) max White uPVC panelled front entrance door with double glazed patterned, bevelled and decorative leaded upper light. White uPVC double glazed window to side with polished marble sill. Central heating radiator concealed in latticed cabinet. Light neutral decor. Recessed LED chromed spotlight to ceiling. Polished travertine tiled floor. Black polished granite skirting boards. Access to first floor staircase. White panelled and Georgian style glazed door to living room. LIVING ROOM 13′ 10" x 13′ 8" (4.22m x 4.17m) max White uPVC double glazed bay window to front with vertical blinds. Central heating radiator. Feature dressed stone monumental style fireplace with polished black ‘star galaxy’ granite insert and hearth. Brushed stainless steel, cast iron and chromed style pebbled effect living flame gas fire. Sky digital / cable / TV aerial points. Telephone / broadband internet point. Dimmer light switch. Light neutral decor. Ceiling coving. Moulded skirting boards and door architraves. White panelled and Georgian style glazed doors leading to entrance hall and breakfast kitchen. BREAKFAST KITCHEN 16 ‘ 7" x 7’ 11" (5.05m x 2.41m) max Modern fitted white gloss wall and base units including: brushed stainless steel wine fridge; integral automatic washing machine; two tall larder cupboards; corner cupboard with ‘magic corner’ retractable shelving unit; cutlery drawer and pan drawers; feature long brushed nickel handles; soft closure to doors and drawers; LED kickboard lighting; moulded cornice and pelmets with concealed downlighters. Polished rose granite worktops and four seater breakfast bar with matching upstands and cutting boards. Inset 1.5 bowl stainless sink with fluted drainer and chromed monobloc tap. ‘Neff’ four ring black glazed ceramic electric induction hob, polished granite splashback, extractors and lights over in ‘Neff’ feature brushed stainless steel canopy hood. ‘Neff’ brushed stainless steel electric fan assisted oven. Space and plumbing for American style fridge. Wall mounted gas combi instant hot water boiler. TV aerial point. Light neutral decor. Recessed LED chromed spotlights to ceiling. Polished travertine tiled floor and matching skirting. White uPVC double glazed window to side with deep polished granite sill. White uPVC panelled rear entrance door with double glazed patterned, bevelled and decorative leaded upper lights. White panelled and Georgian style glazed door to living room. Open square archway and two steps down to lower dining room. EXTENDED LOWER DINING ROOM 8′ 10" x 7′ 10" (2.69m x 2.39m) Previously used as a sitting room. White uPVC double glazed window to rear with polished pink granite sill. Light neutral decor. Polished travertine tiled floor and matching skirting boards. Two steps and open square arch up to breakfast kitchen. STAIRCASE AND LANDING 6′ 6" x 3′ 3" (1.98m x 0.99m) max Feature brushed stainless steel banister rail to half return staircase. Varnished timber bevelled square spindled balustrade to landing. White uPVC double glazed patterned window to side with polished pink granite sill. Access to loft. Light neutral decor. Recessed chromed LED spotlights to ceiling. Moulded skirting boards and door architraves. White panelled doors to three bedrooms and bathroom. DOUBLE BEDROOM 1 11′ 2" x 10′ 8" (3.4m x 3.25m) White uPVC double glazed window to front with polished black ‘star galaxy’ granite sill. Central heating radiator. Space for wardrobes and bedroom furniture. TV aerial point for wall mounted television. Neutral decor. Moulded skirting boards and door architraves. Georgian style panelled white wood grain effect door to landing. 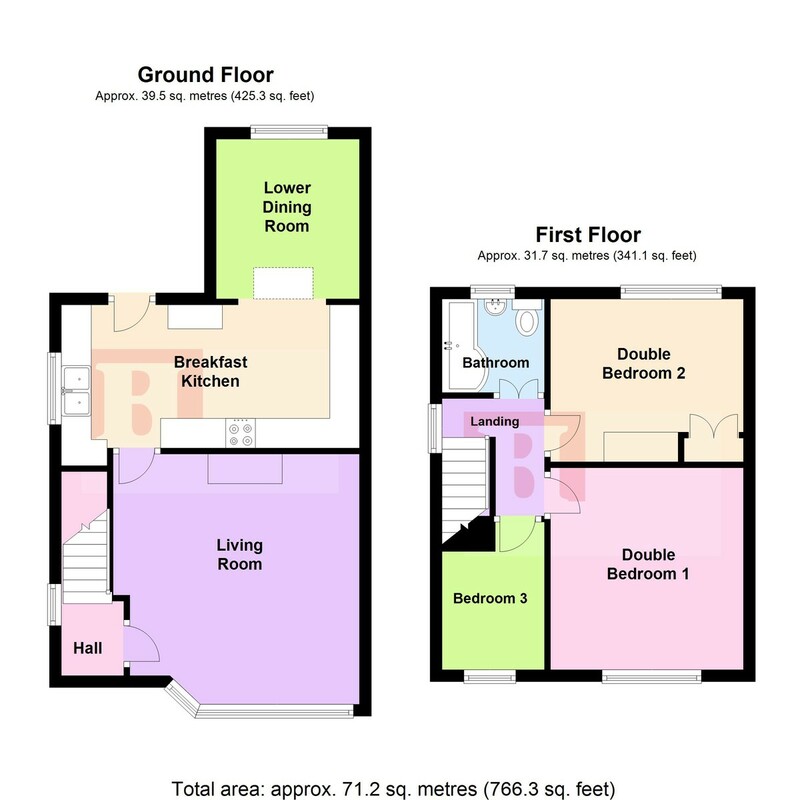 DOUBLE BEDROOM 2 10′ 8" x 9′ 0" (3.25m x 2.74m) max White uPVC double glazed window to rear with moulded architrave. Central heating radiator. Built-in double wardrobe to chimney alcove including shelving and double hanging space. Space for bedroom furniture. TV aerial point. Light neutral decor. Moulded skirting boards and door architraves. Georgian style panelled white wood grain effect door to landing. BEDROOM 3 8′ 2" x 5′ 8" (2.49m x 1.73m) max White uPVC double glazed window to front with polished black ‘star galaxy’ granite sill. Central heating radiator. Storage shelf to stairhead. TV aerial point. Light neutral decor. Moulded skirting boards and door architraves. Georgian style panelled white wood grain effect door to landing. BATHROOM 5′ 7" x 5′ 0" (1.7m x 1.52m) Modern white three piece spa bathroom suite with chromed fittings. Whirlpool spa panelled ‘P’ bath with mixer tap, pop-up waste, mixer shower tap, twin monsoon and hand held microphone shower heads, curved glazed shower screen and polished black ‘star galaxy’ granite vanity shelf. Rectangular vanity wash hand basin with monobloc tap, flip plug and storage cupboard below. Close coupled WC with matching white soft closure seat. Chromed central heated towel rail. Extractor unit. Bevelled wall mirror. Polished travertine tiled walls and floor. Recessed halogen chromed spotlights to ceiling. White uPVC double glazed patterned window to rear with black polished ‘star galaxy’ granite sill. Victorian style panelled white bi-fold door to landing with polished black ‘star galaxy’ architrave and threshold. EXTERIOR REAR Enclosed rear lawned, patio and decking terrace garden. Riven Indian stone flagged patio. Lawn with raised alpine, miniature conifer and rockery borders with capped stone walling. Raised decking patio terrace. Brick built detached outhouse with power and light, side window, shelving and work bench. Exterior cold water tap. Security sensor light. Wood paling fencing. Braced wooden gate to drive. Steps to rear entrance door. South westerly aspect. EXTERIOR FRONT Recently installed resin bonded pebbled forecourt / patio garden and tandem double drive with parking for up to three vehicles and screening privet hedge to side. Feature semi circular dressed stone steps to front entrance door with courtesy light and pitched open awning to front elevation. Dressed stone capped brick boundary walls and gate posts. Exterior cold water tap. Courtesy light. Braced wooden gate and brick wall with security sensor light leading to enclosed rear garden. White uPVC panelled front entrance door with double glazed patterned, bevelled and decorative leaded upper light. White uPVC double glazed window to side with polished marble sill. Central heating radiator concealed in latticed cabinet. Light neutral decor. Recessed LED chromed spotlight to ceiling. Polished travertine tiled floor. Black polished granite skirting boards. Access to first floor staircase. White panelled and Georgian style glazed door to living room. White uPVC double glazed bay window to front with vertical blinds. Central heating radiator. Feature dressed stone monumental style fireplace with polished black 'star galaxy' granite insert and hearth. Brushed stainless steel, cast iron and chromed style pebbled effect living flame gas fire. Sky digital / cable / TV aerial points. Telephone / broadband internet point. Dimmer light switch. Light neutral decor. Ceiling coving. Moulded skirting boards and door architraves. White panelled and Georgian style glazed doors leading to entrance hall and breakfast kitchen. Modern fitted white gloss wall and base units including: brushed stainless steel wine fridge; integral automatic washing machine; two tall larder cupboards; corner cupboard with 'magic corner' retractable shelving unit; cutlery drawer and pan drawers; feature long brushed nickel handles; soft closure to doors and drawers; LED kickboard lighting; moulded cornice and pelmets with concealed downlighters. Polished rose granite worktops and four seater breakfast bar with matching upstands and cutting boards. Inset 1.5 bowl stainless sink with fluted drainer and chromed monobloc tap. 'Neff' four ring black glazed ceramic electric induction hob, polished granite splashback, extractors and lights over in 'Neff' feature brushed stainless steel canopy hood. 'Neff' brushed stainless steel electric fan assisted oven. Space and plumbing for American style fridge. Wall mounted gas combi instant hot water boiler. TV aerial point. Light neutral decor. Recessed LED chromed spotlights to ceiling. Polished travertine tiled floor and matching skirting. White uPVC double glazed window to side with deep polished granite sill. White uPVC panelled rear entrance door with double glazed patterned, bevelled and decorative leaded upper lights. White panelled and Georgian style glazed door to living room. Open square archway and two steps down to lower dining room. Previously used as a sitting room. White uPVC double glazed window to rear with polished pink granite sill. Light neutral decor. Polished travertine tiled floor and matching skirting boards. Two steps and open square arch up to breakfast kitchen. Feature brushed stainless steel banister rail to half return staircase. Varnished timber bevelled square spindled balustrade to landing. White uPVC double glazed patterned window to side with polished pink granite sill. Access to loft. Light neutral decor. Recessed chromed LED spotlights to ceiling. Moulded skirting boards and door architraves. White panelled doors to three bedrooms and bathroom. White uPVC double glazed window to front with polished black 'star galaxy' granite sill. Central heating radiator. Space for wardrobes and bedroom furniture. TV aerial point for wall mounted television. Neutral decor. Moulded skirting boards and door architraves. Georgian style panelled white wood grain effect door to landing. White uPVC double glazed window to rear with moulded architrave. Central heating radiator. Built-in double wardrobe to chimney alcove including shelving and double hanging space. Space for bedroom furniture. TV aerial point. Light neutral decor. Moulded skirting boards and door architraves. Georgian style panelled white wood grain effect door to landing. White uPVC double glazed window to front with polished black 'star galaxy' granite sill. Central heating radiator. Storage shelf to stairhead. TV aerial point. Light neutral decor. Moulded skirting boards and door architraves. Georgian style panelled white wood grain effect door to landing. Modern white three piece spa bathroom suite with chromed fittings. Whirlpool spa panelled 'P' bath with mixer tap, pop-up waste, mixer shower tap, twin monsoon and hand held microphone shower heads, curved glazed shower screen and polished black 'star galaxy' granite vanity shelf. Rectangular vanity wash hand basin with monobloc tap, flip plug and storage cupboard below. Close coupled WC with matching white soft closure seat. Chromed central heated towel rail. Extractor unit. Bevelled wall mirror. Polished travertine tiled walls and floor. Recessed halogen chromed spotlights to ceiling. White uPVC double glazed patterned window to rear with black polished 'star galaxy' granite sill. Victorian style panelled white bi-fold door to landing with polished black 'star galaxy' architrave and threshold.